yoyorecreation - High Performance Hybrid Yo-Yo! Yoyorecreation is among the best high end yo-yo manufacturers in the world. They are making some of the finest yo-yos that money can buy and are becoming more and more popular among casual and professional yo-yo players alike. They ventured into the plastic yo-yo market with their popular Diffusion and now they are entering the plastic/metal hybrid arena with the all new Triad! If you've always wanted to grab a Yoyorecreation yo-yo but just didnt have the funds, this is the yo-yo for you! The Triad provides the ideal combination of high-end Japanese metal performance and the carefree feel of a plastic yo-yo. It is the perfect every day carry, take it with you wherever you go without the anxiety or worry of dinging your favorite mint condition metal. 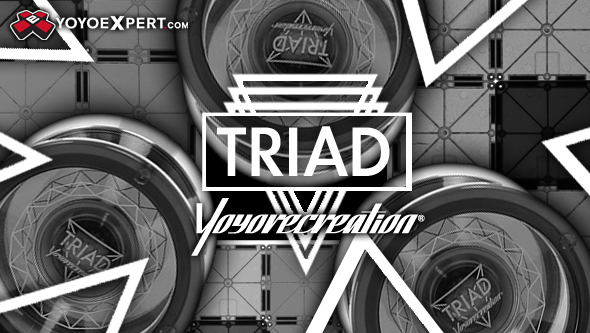 With a steep v-shape and a very rim focused weight, thanks to the added weight rings, the Triad definitely has that high performance Yoyorecreation feel without that high performance price. Stable, fast, and maneuverable, this yo-yo is sure to impress! Note: This yo-yo has been built using unique Central Rim Weighting and is officially licensed by YoYoJam to use their patent.